American DJ Octo Beam RGBW DJParts - All Variety of Parts that DJ Needs. 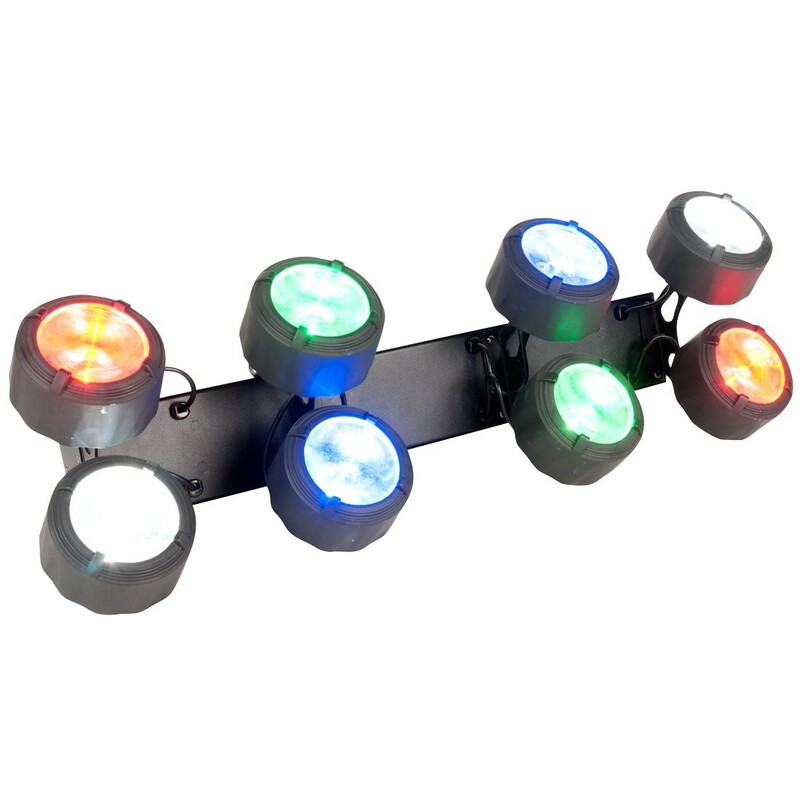 The ADJ Octo Beam RGBW produces a classic disco lighting beam effect with a modern LED twist! This 8-head Beam effect is powered by two red, two green, two blue and two white 3-Watt LEDs. It produces sharp, bright beams at a 3.4 degree beam angle. The Octo Beam RGBW has 3 DMX channel modes (1, 8 or 10), 3 operational modes (Sound Active, Show or DMX modes), LED pulse and strobe effects and 0-100% electronic dimming. The rear control panel features a 4-button LED display menu, 3-pin DMX In/Out connections and IEC In/Out for power linking up to 12 units at 120V or 19 units at 230V operation. This fixture is compatible with the ADJ UC3 easy-to-use controller. Specifications: - 2-Foot (25-inch) indoor Linear Fixture with 8x 3W LEDs (2 Red, 2 Green, 2 Blue & 2 White) - 3 DMX Channel modes: 1, 8 or 10 channel modes - 3 Operational modes: Sound Active Mode, Show Mode, & DMX Controlled - Stand Alone or Master-Slave Configuration - LED pulse & strobe effect - Flicker Free - Electronic Dimming: 0 - 100% - Beam angle: 30-degree - Linkable via 3-pin XLR cable - 4-button LED display on rear panel - IEC AC IN/OUT on rear to daisy chain power (up to 12 Octo Beam RGBW’s @ 120V and 19 Octo Beam RGBW’s @ 230V ) - Compatible with American DJ UC3 Series easy-to-use controllers (sold Separately) - Includes mounting yoke to mount on a wall or on to trussing - Long life LED (Rated at 50,000 hrs.) - Low power consumption - Safety loop on rear - Run all night – No duty cycle - Multi-voltage: 100-240V, 50/60Hz - Power Draw: 28.5W max - Dimensions (LxWxH): 632.6 x 226.9 x 199mm - Weight: 3.5 kg. Specifications subject to change without notice.